Two of the premier associations supporting music for young people announced today that they are joining forces. "By elevating music education in America and by bringing to public attention the ways that music strengthens individuals and communities alike, our work together will signal a renewed emphasis on achievement in our society," said Mark Arnold, chairman of the Board of Directors of DCI. MENC President Barbara Geer added that "This world-class joint effort to add quality to life through music learning and performance will lead education by example. Together, we will continue to promote world-class standards in music education and in student performance. Furthermore, we encourage others to renew their commitment and join with us in the ongoing task of making certain that every student gets a full, balanced education that includes music." The agreement to cooperate by the two organizations constitutes a pledge to ramp up delivery of the message of the value of music, and to recognize the music teachers and professionals who make music possible in our communities. The associations build on a history of cooperation, including work on the U.S. Army All-American Marching Band, a Blue-ribbon Panel for Marching Music, and events for the National Anthem Project and for the annual Music Education Week in Washington. Establishing a focus for a Band Forum at future Music Education Week in Washington events. MENC: The National Association for Music Education, among the world's largest arts education organizations, marked its centennial in 2007 as the only association that addresses all aspects of music education. Through membership of more than 75,000 active, retired, and pre-service music teachers, and with 60,000 honor students and supporters, MENC serves millions of students nationwide through activities at all teaching levels, from preschool to graduate school. MENC's mission is to advance music education by encouraging the study and making of music by all. Since 1907, MENC has worked to ensure that every student has access to a well-balanced, comprehensive, and high-quality program of music instruction taught by qualified teachers. MENC's activities and resources have been largely responsible for the establishment of music education as a profession, for the promotion and guidance of music study as an integral part of the school curriculum, and for the development of the National Standards for Arts Education. MENC is located at the National Center for Music Education in Reston, Va. Drum Corps International (DCI) is the world leader in producing events for the world's most elite and exclusive marching ensembles for student musicians and performers. Founded in 1972, Drum Corps International has developed into a powerful, nonprofit, global youth organization with far-reaching artistic, educational and organizational influence. Drum Corps International is Marching Music's Major League?„?. 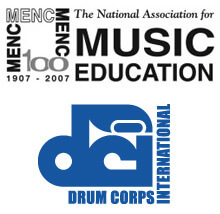 Drum Corps International is located in Indianapolis, Ind.